England & Co at Zoo Art Fair, London: daily Movie Protocol live notations. Roman Chester Reprojections, a Chester Performs commission for Up the Wall, Chester. Time Is a Sausage, group exhibition at domobaal gallery, London. Movie Protocol: Metropolis, performance for City X, at England & Co, London. The Garden of Cyrus, group exhibition, interventions referencing Sir Thomas Browne's writings, Norwich. East Wing Collections VIII, five Reprojection performances at the Courtauld Institute's biennial group exhibition at Somerset House, London. Persistent Obsessions, group exhibition at England & Co.
Torstrasse Reprojections, commissioned for Haus der Vorstellung, Berlin-Mitte. Circumnavigating the Beast of Exmoor; Ada's Key [256 Bytes], residency-based projects in Exmoor National Park for TRIPARKS. 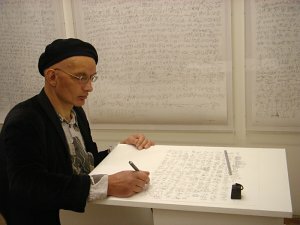 Group exhibition touring in 2009. Blades of Grass, performance/installation for Camberwell Arts Festival '08, London. The Origin of Sculpture, participatory live art work commissioned for Peckham Flavas, London. MAP Live '07, international performance festival and exchange programme. New live works at Tullie House, Carlisle, incl. The River Eden Psychohistory Project; at ZAZ Festival, Tel Aviv, Jerusalem, Mizpe Ramon, Israel and at Ars Radionica Lazareti, Dubrovnik, Croatia. The Path of Light Is Not a One-Way Street, Peckham Multiplex, a live art work for Peckham Shop Windows, London (curator: Emily Druiff). Camberwell Reprojection, Addington Square, for Camberwell Arts Festival '07, London. Upstaging Nature, group exhibition, Sydenham Hill Woods, London. MEME, group exhibition, a Cafe Gallery Projects (CGP) off-site project, Tower Bridge Business Complex, London. UND #2 - Karlsruhe art initiatives and international guests, group exhibition, Karlsruhe, Germany. The First Bite Is the Deepest, participatory live art commission for Flavas of Peckham, London. Shibboleth, group exhibition Dilston Grove, London. Hull Reprojections, a commission for Light Night, Hull Art Lab, Yorkshire. Produce, three market stall based live art works at the Civic Centre Estate, Birmingham. Elegant Low-Tech, performance event, Friction Arts, Birmingham. Zaun Ueber, group show, installations and performances at Amalienpark, Berlin-Pankow, Germany. Janus, group exhibition at Cafe Gallery Projects, London. Perfect Square Day, performance triptych, 13/14 Jan., at Area10, Peckham, in the streets of North Southwark and at Coleman Project Space, London. Seeing the Light, group exhibition at Stephen Lawrence Gallery, University of Greenwich, London. Melting Plot, a series of site-responsive performance collaborations with Beth Elliott at venues across London. 30 performances with Psychological Art Circus (PAC) in London, Paris, Zagreb. REAP, art projects capturing a year, initiated and commissioned by Anne Bean/artsadmin; group exhibition at Cafe Gallery Projects, London. HAY DAY, a day of live art at Cafe Gallery Projects, London, co-organised with Charlie Fox. T-Rent, performance intervention at Riverside Festival Nottingham (initiated by +graft). Bow[o]man Cosmetics, a street market based live art commission for Bow Festival '05, London. Obus2: OHP Road Movies, four new performances on and around the PAC's Routemaster bus, Peckham, London. Weltapfel, installation, for IN THE BAG, group exhibition at Brixton Art Gallery, London. Zebra (collaboration with Melina Berkenwald), process-based installation at Area10, London. Day 16K, durational performance on the artist's 16,000th life-day (24/25 Dec.) at Area10, London. Fruit/Veg Chess East, a street market based live art commission for Bow Festival '04, London. intershop2/suedstattsued, Neuer Kunstraum Karlsruhe, Germany. New work developed during a residency in a drinks outlet, incl. Johannistag (Cup of Sorrow), Random-Rundum Observation, Endgame Ticker and Performative Guidance collaborations with Harry Palmer. A Slither And A Slice, group exhibition at Cafe Gallery Projects, London. Silkworms' Dream, performance/installation for The Garden of Earthly Delights, Brockwell Park, London (curator: Indra Khanna). Carmen Horti Whittensis; To Anna Blume, two new performances for soprimaverdada, Area10, London. Straight from the heart, durational performance for Bobs Punkt at Area10, London. Face Value Portrait Services/Ladywood Branch, a Gallery In The Trees / Birmingham City Council commission for the Summerfield Festival, Birmingham. Face Value Brixton, commissioned for Flypitch, Brixton Market, London (curator: Indra Khanna). Gorf Castle Ball- and Drawing Room, Clean Sweep, Herbarium Whittense, Spawning: new site-specific installations/performances at Area10, London. C.R.E.H.A. (Centre or Research into Emotional Hygiene through Art) operating from Area10, London. Ticker, performance for EEC '02, Queen Mary University, London. Tick-Toer/Toe-Ticker, performance for eel, 291 Gallery, London. Song of Songs; Manna Mine: new site-specific installations at Braziers International Artists' Workshops, Braziers Park, Oxfordshire. Royal Crunch, participatory performance, Kennington Park Cafe, for Vauxhall Festival, London. Ain't No Love For Sale: The Deptford Voracle, a DeptfordX market stall performance, London. Ticker Self, performance for the artist's 15,000th life-day, Cafe Gallery Projects, London. Nothing Other, Brother/Nothing Sinister, Sister, a DeptfordX market stall performance, London. In the event of emergency, live art event at Dilston Grove, London. Fruit Fall, group exhibition, Vauxhall St Peters Heritage Centre, London. C.R.E.H.A. launched as a Cafe Gallery Projects live art commission, London. Play All Day, a 24-hours live art event, Dilston Grove, London. ARK2000 - an experimental work, Dilston Grove, London. A Kunstbruecke project, collaboratively coordinated/curated with Hein Spellmann, Berlin. Re-Cover, an installation/live art work for Plot at The Paper Bag Factory, DeptfordX, London. Face Value [pilot] - Cash for Sale, a DeptfordX market stall project, London. Fresh Scents for Chess Friends, for Live Art at Southwark Park, London. Put Your Hands Together For The Kelling Sea-Feed, a week long residential project, Kelling Festival, Norfolk. Fruit/Veg Chess, premiered at DeptfordX Goes To Market, London. Eat Your Words/Launch of the Sushi Armada, a work in two parts for Inter/action, an international live art event at Bermondsey Carnival, Southwark Park, London. bookarts in britain, a British Council touring group exhibition to Poland and the Baltic States. A DOT ON THE MAP, a mapping, mail art and new technology project (interactive CD ROM production) commissioned by Cumbria Arts in Education, connecting 13 schools across the county. Collaboration with Sal Wood, Geoffrey Stocker, Audrey Barker. Installation/project presentation at Charlotte Manson College, Ambleside (1996), The Blackie, Liverpool (1997) and Shaddon Mill Gallery, Carlisle (1999). Pentameter, installation at Childers Street Studios, Deptford, London. 3:36, time-and site-specific installation (collaboration with Sal Wood) for Sites Abroad, Ipswich, Suffolk. Nackthund Horizons, installation, Limelight Gallery, Lewisham Library, London. Waves and Minds, mixed media works, Brewhouse Arts Centre, Taunton, Somerset. Stranger Than Fiction, book art, group exhibition at Site Gallery Sheffield. just now, site-, time- and light-specific installation (collaboration with Sal Wood) at the artists' East London home. Documentation shown at Jack Dash Gallery, London E14. Art in Boxes, group exhibition at England & Co, London; also at Nottingham Castle Museum and Art Gallery. Contemporaries, four artists at the Eagle Gallery, London. Art in Boxes, group exhibition at England & Co, London. Drawings (with Klaus Fuchs), two German artists at 36 Gloucester Drive, Finsbury Park, London. Alles Offen, paintings/installation, Brombergstrasse Studio Gallery, Freiburg i.Br., Germany. 13 Tage Friedrichsbau, group exhibition, Freiburg i.Br., Germany. Speaker at Prints on the run: On escaping institution symposium at the Victoria and Albert Museum, London. Scatter, one year of time- and process-based works with pupils at Redriff Primary School, Rotherhithe, London (a REAP project). Visiting lecturer, University College Suffolk, Ipswich. On Time. The East Wing Collection VIII, 2008. The Eccentric City Vol.1a (2006) & 1b (2007). Open space: art in the public realm in London 1995-2005, Arts Council England, 2007. Prints Now: Directions and Definitions by Gill Saunders and Rosie Miles, V&A Books, 2006. News from Arts Council England London, Issue No. 02-09.04. Vore: Moeglichkeiten der Transformation, from: Das Labyrinth oder Die Kunst zu wandeln (ed. Ilse M, Seifried), Haymon Verlag Innsbruck/Austria, 2002. ARK2000 - an experimental work (Kunstbruecke publication, 2000; texts by Sasha Craddock and Harald Smykla / Hein Spellmann, photos by D S Allen) ISBN 0-9536340-3-5. Staatliche Akademie der Bildenden Kuenste Karlsruhe (studied Painting/Printmaking). Albert Ludwigs Universitaet Freiburg, Germany (studied Biology). London Arts Development Fund Bursary (2002). Peabody Trust Millennium Award (for ARK2000). Studio Grant of the Land Baden-Württemberg, Germany (1986-88). PREVIOUS PROJECT FUNDERS include: Arts Council England, London Arts, Northern Arts, Millennium Commission, Visiting Arts, Cumbria County Council, Birmingham City Council, LBO Southwark, The Paul Hamlyn Foundation, Cafe Gallery Projects.